Many people don’t realize that getting quality dental care is a vital part in maintaining overall health. Because taking care of your teeth and gums is so important, we want everyone to have access to the services and treatments they need. Dr. Inna and her team take time to thoroughly evaluate every patient and develop a long-term plan. 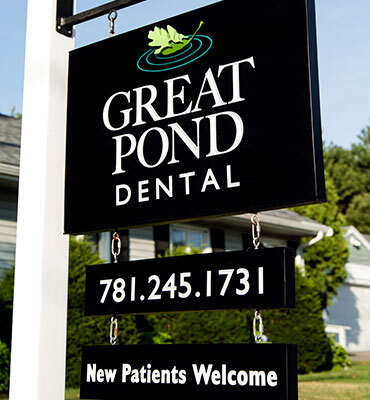 Great Pond Dental currently takes both in-network and out-of-network providers. Our team is experienced with filing claims and maximizing benefits, so you don’t have to worry with the hassle of insurance paperwork. We want your time with us to be stress-free, so let us do the work for you. Great Pond Dental also accepts flexible spending accounts as well as health savings accounts. If you are planning on paying with an FSA or HSA from your employer, a member of our team will review your information and coordinate on your behalf to get the most out of your funds. As with insurance, we are familiar with the necessary procedures to help patients get the care they need. CareCredit® patient financing lets you divide your treatment costs into low monthly payments across 6, 12, 18, or 24 months. This option is a great choice for patients who don’t currently have dental insurance. To learn more or to fill out the easy application, visit the CareCredit website. You’ll receive a credit decision quickly. If you would like to cover your costs in one go, we are happy to accept most major debit and credit cards. Our practice also extends a professional courtesy to our senior patients in a form of $20 off of dental cleanings.